It's so nice to take a day off to do nothing. And, that's exactly what I did on Friday. Wednesday was the fête nationale in France so I had the day off, and I worked it out with my colleague to take advantage of the empty office and take a long weekend. I didn't have anything in particular planned, but I ended up being really productive around the house. 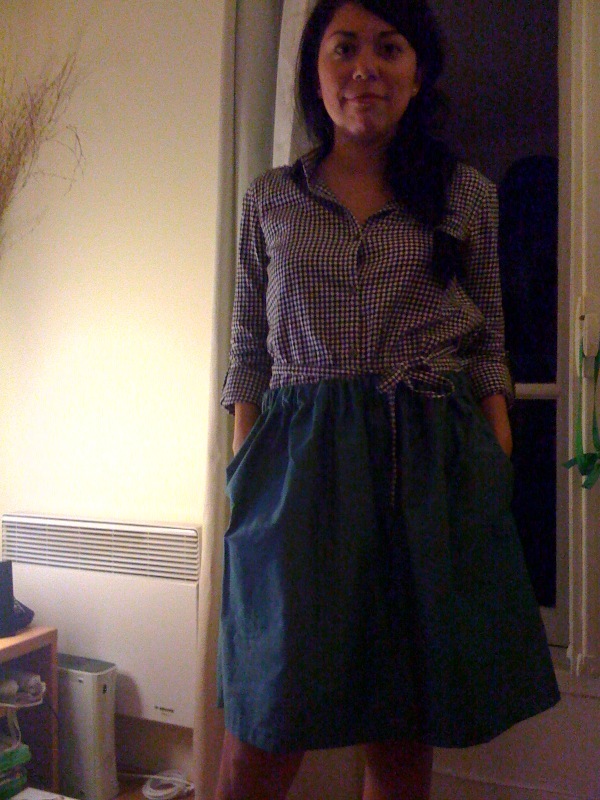 I even made a skirt! I haven't sewn in ages, but I wanted to use up some fabric I've had stocked up for a while, so I found this tutorial and gave it a go. 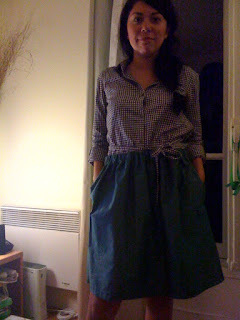 Well, I think I'm a little rusty from being out of the game for so long, and I ended up with a skirt more in the size L range than my more usual size, XS. I took my measurements and all, but I think I over-compensated for my waste size, thinking I would go larger in case I needed room to grow. 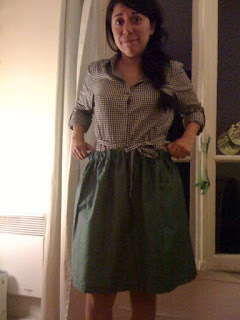 So, I ended up with a poofy, green, bag-of-a-skirt that adds on about 20 pounds to my lower-half...and that's just never flattering. What can I say? I just haven’t been in the mood to write. I feel a bit like I’ve put half of my life on hold to focus on the other, lacking half. But, that’s kind of the ultimate human struggle, isn’t it? You plan and then you do. Plan and do. And for me, it’s teetering on the brink of impossibility to be able to balance my wants and needs, my pleasures and responsibilities, my dreams and reality. So, I stay focused on one for now and hope that one day balance will just come. We’ve been in a bit of a limbo here these past couple of months, trying to solidify some real next steps to take, but just waiting on the light to turn green. Mostly, we’re just waiting to find out if my current contract job will evolve into a permanent position. It wouldn’t seem like this one little detail could make or break our plans, but it kind of already has. The odds are, we’ll be hanging around Paris for at least a couple of more years – before all the baby-making and home-buying starts – which is just peachy for both of us, but kind of puts a 180-degree spin on all the plans we previously made (i.e. the ones that involved packing it up and moving it back to the Lone Star State). We’re keeping our fingers and toes crossed that we’ll have a finite answer by the end of this month, but, well, it’s France, and that’s kind of asking for a lot. But, it’s sunny in Paris. I mean, really sunny! And hot, too! We had a hard winter and it seems summer isn’t letting its colder competitor take the Harshest Season of the Year title with ease. Gui and I left for two weeks to Dallas/Kansas/Austin when the skies were an unyielding gray and the metros were still rank with urine and not repulsive body odor. But, it seems we brought the sunshine and heat with us on the flight back and it’s been pretty non-stop since then. We’ve been spending the long summer days mostly enjoying each other’s company – doing lots of necessary admin stuff, restocking the fridge, cooking and organizing, planning and pondering, and even a little soldes shopping. Two weeks isn’t very long to be away from home, but it’s always a little more difficult to get back into the swing of things after a trip to Austin. Our friends and family, of course, spoiled us to no end, making it so hard to leave them behind until our next visit. If only life was a vacation, right? Which reminds me, we’ve got another week of holidays planned soon. We’ll be heading to the south of France to spend some time by the pool and in the ginormous vegetable garden (yay!) at Gui’s grandparents’ house. Then, we’re off to Aubrac for what will surely be a lovely, countryside wedding (horses included). We had planned to get out of France and maybe hit up Italy with a friend, but we just couldn’t work out the logistics to make it work. Next time, I suppose.